The rocket-powered Me-163 Komet owed its existence to Dr Alexander Lippish who had begun design tailless gliders in 1926. Over the years, Lippish had designed several successful tailless gliders, a few of which featured a delta wing design. In 1939 Lippish was asked by the German Air Ministry to come up with a design to utilize a new secret, rocket engine, the Walter J-203 that produced 882 lbs of thrust. The new rocket propelled plane never developed as it had been hoped. Instead of metal fuselage, Lippish fitted an all wood airframe design called DFS 194 with the Walter RI-203 at Peenemunde-West. On June 3rd 1940, test pilot Heini Dittmar took the aircraft on its maiden flight and successfully reached a speed of 340 miles per hour in level flight. Further development led to the evolvement of a high-speed, fast climbing interceptor that could stay on the ground until the enemy was almost overhead. With this strategy, the brief endurance of the rocket-powered flight would not be a negative factor. 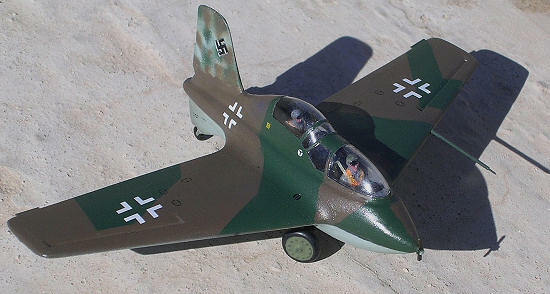 Thus was born the Me-163. Further development on the programme continued and despite the bombing of Peenemunde, the unit then formed continued to train there. The unit with some 30 pilots was moved to Bad Zuischenaken. Tr4aining during power flights was dangerous due to the explosive power of the fuels and the fact that landings permitted nom second chance, even though the aircraft came in at 137 mph. The Me-163B was equipped with two 30mmcannons mounted in the wing roots. The aircraft featured a revised 16B gun sight, a 90mm armoured glass beneath the plexiglass canopy and armour behind the pilot’s back over the nose cone. Nearly 300 Me-163s were in front line service at the end of the war but the aircraft gained only 9 victories. Although casualties were high in the Me-163 units only 14 of the aircraft were lost in combat. A full 80% of the losses came during landings and take offs. The Me-163 was an exceptional aircraft many years ahead of its time in many of its features. Undoubtedly it was much better psychological weapon than it was an interceptor. On The 13th May 1944, Major Wolfgang Spate, commander of the E16 test unit, flew the Me-163B Komet interceptor fighter on the first operational sortie. This was against a USAAF P-47 Thunderbolt. In spring of 1944 the design of a two seat Me-163 version started to facilitate the training of the pilots that were for combat on the Me-163Bs. The first prototype was an adaptation of the stretched Me-163B airframe with the fuselage T-Stoff and ammunition tanks removed from the bays immediately aft of the cockpit to make space for the instructor’s cockpit. The Me-163S was ready in May 1944 and was flown for the first time by pilot Hohmann. It was flown purely as a glider, being towed off the ground by a Bf-110. Following trials a decision was reached to produce 42 of the S two seaters. 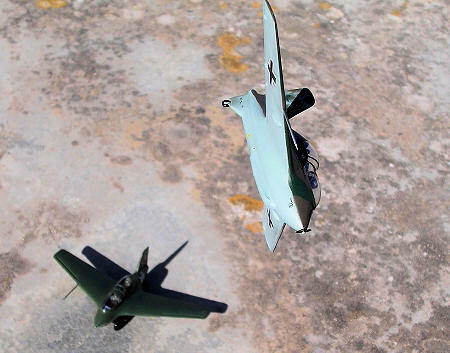 The S version had a differently shaped instructor’s canopy. Only a small number were completed, as the combat version was more important. 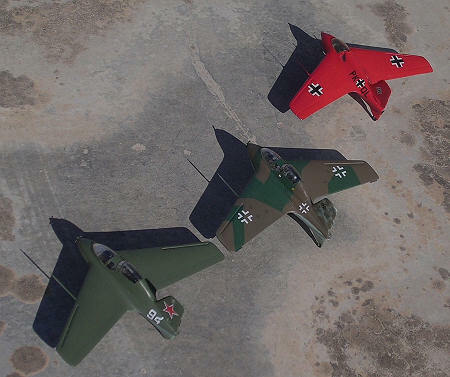 A few Komets including some two or three Me-162S were acquired by the Soviet Union. These aircraft were tested by V.E.Golofastov, M.Gallay, C.K. Mosolov and some other test pilots. Editor's Note: I think Carmel's information on the 163S might be a bit out of date. According to 'Me-163, volume 2' by Classic Books, 2003, the Me-163S mock-up was not initially inspected until 23 June 1944 with the first towed flight taking place on 29 December 1944. Most of the few 163S airframes were converted from B models as the contract for 30 163S planes was cancelled in November 1944 after only two examples had been built. The handling qualities of the aircraft were said to be good, but the instructor's inability to see during landings (the primary purpose of developing the two seat version) made the aircraft unacceptable to operational units and the type was was never used in training. Apparently what few flights made in this aircraft were towed and the book could not find instances of powered flights undertaken either the Luftwaffe or by the Soviets who captured several of these aircraft. Pavla has made its name with successive release of WW2 combat aircraft and I believe was also the first to issue the Me-163S to the 1/72 scale market and to include brass etch parts in its kits on an almost regular basis. The Me-163S was built in a very limited numbers, a practically underpowered conversion trainer that was used to familiarise the rocket interceptor pilots with take offs and landings of the little winged aircraft. The Pavla kit comes in a box with two views of the Me-163S trainer in colour on the outside cover. Opening the box reveals a fret of short run material with 22 grey coloured plastic pieces, two clear vac form canopies (one of which being spare), 27 brass etch items on a single fret, and a decal sheet for two aircraft, a Luftwaffe machine and a captured Soviet one. A 4-stage, easy to follow instructions comes with the kit with the last of four pages dealing with colour information and decal emplacement. The first stage of construction deals with the assembly of the two separate crew offices. The front instruments and side consoles are the first items to start with, and then add the crew seats complete with the seat straps in brass. At the back of the rear seat there is a firewall item, which is then fixed in place. More interior detail comes in form rudder pedals, control sticks, and control handles to fit to sides of cockpit. A side view section drawing clearly show how the two cockpits are staggered making the seating arrangement at different level so that the rear instructor seat is more elevated giving an unobstructed view.. The vac form canopies are very clear and it is a pity to leave these in the closed position since some of the interior detail comes hidden. 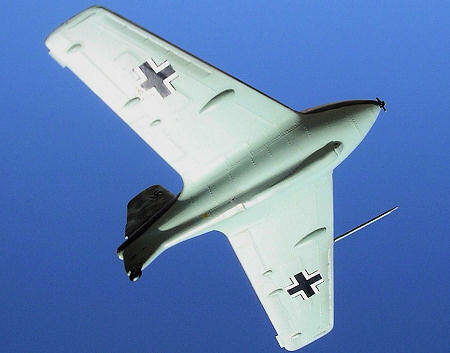 The wings, which come into four parts, may contain a trim tab to the aileron and this applies to the German version only. There is a choice of assembly to the tail wheel in faired or unfaired position. This has to conform to the position of the undercarriage skid, which can be fitted either retracted or extended. The skid carries the main wheel dolly. A long antenna is fitted to the port wing leading edge. This I replaced with one made of steel since it is prone to breaking. This had equal length and thickness to the plastic kit antenna. I experienced no difficulty with the fit of parts and if one elects to fix the skid in the extended position as it should be when the aircraft is in landing mode one should make use of super glue to fix the brass etch bracket details that go with the skid. The rudder trim tab also comes in form of a rectangular brass piece, which gives the scale effect. The wing joints to the fuselage needed a little filler followed by smoothening with wet and dry. As often is the case with Pavla kits there is a spare canopy. Like I did in previous Pavla kit builds I took advantage to use the extra items like the spare canopy and spare decal option that comes with these kits. In this case I went out of my way to update and convert a Lindberg Me-163B into a 163S. Apart from some superficial detail I modified the kit by cutting the upper part of the fuselage deck to take the new two-seat canopy. In fact this proved to be a much simple task than I thought as it only involved marking with a pencil the line at which the trimmed vac form canopy had to join the fuselage. The area marked was then carefully cut with an Exacto saw blade. The interior of the two cockpits was then built up using thin plastic card and crew seats from spare box etc. The cockpit interior basically consists of floor; bulkhead and side panelling are Grey RLM2, the rest in RLM66 Schwartzgrau and the seats in RLM71 Dunkelgrun. 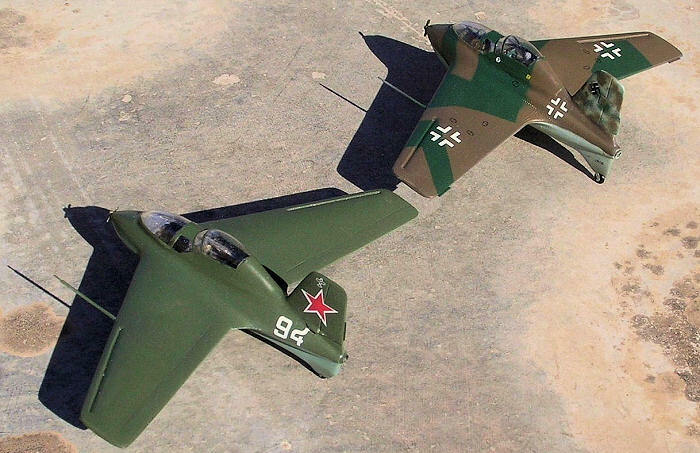 The camouflage colours for the two me-163s differed. The Soviet 163S, made from the Pavla kit has Russian Green Humbrol 114 upper camouflage while the lower surfaces were Russian blue Humbrol 115. The German one was finished in RLM 81, 82 and 76. For the splinter camouflage I used Compucolor CG25 (RLM 81) Brown Violet and Compositor CG 26 (RLM 82) Dunkelgrun. The lower surfaces were airbrushed in Compucolor CG 19 (RLM 76) Hellgrun. The airbrushed models were given a coat of Klear prior to sliding on the decals. Decals were well registered, opaque but are on the thin side and care should be taken not to prolong them in water but to slide them in place with the least of handling. 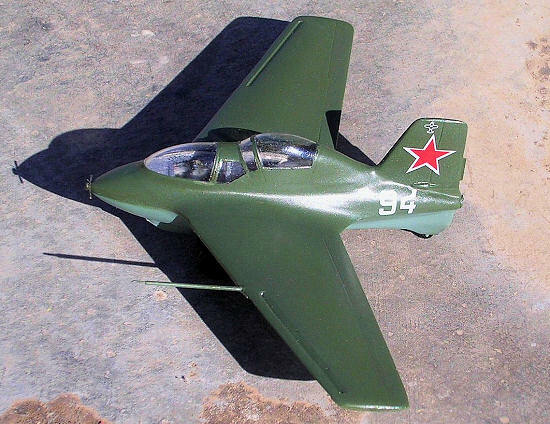 The Russian version represents the one flown by test pilot M.Gallay while the German one was a product of the Junkers Factory and flown from its airfield at Dessau circa 1944. 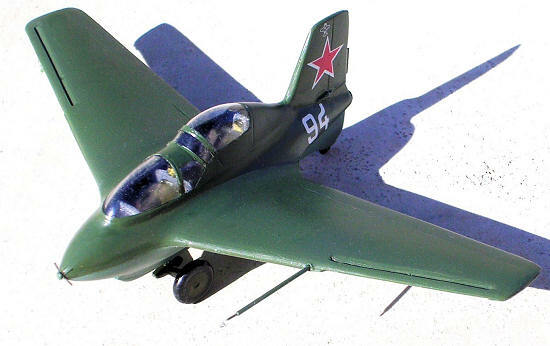 The Pavla Me-163S is a tiny little aircraft kit and an easy short run type to build. It had a peculiar history whose power plant with all its complex chemical fuel mixtures was probably more lethal to the crew who flew it than it was to the enemy. Nevertheless they proved a good start of a new concept in rocket-powered interceptors, which was later, evaluated further when the war ended.